The NBA’s Coach of the Year has been handed out since 1963, when Harry Gallatin took home honors for leading the St. Louis Hawks to a 48-32 record, second best in the five-team Western Division. The Hawks had won just 29 games the previous season but behind 30-year-old Bob Pettit won 19 more games with the NBA’s second-best defense. Since Gallatin through the 2017-18 season, the awards has been given out 56 times, with Don Nelson, Pat Riley and Gregg Popovich each winning the award an NBA-high three times. Five others, including Mike D’Antoni, have won twice. So what’s the best indicator for NBA betting fans to predict who will win the award? There have only been two repeat winners from 2001 to 2018, but in that span we’ve found trends that can help in picking it. This may come as a surprise, but the winner of the Coach of the Year award wins games. Specifically, a whole lot of games. From 2001 to 2018 the Coach of the Year won an average of 58.6 games. 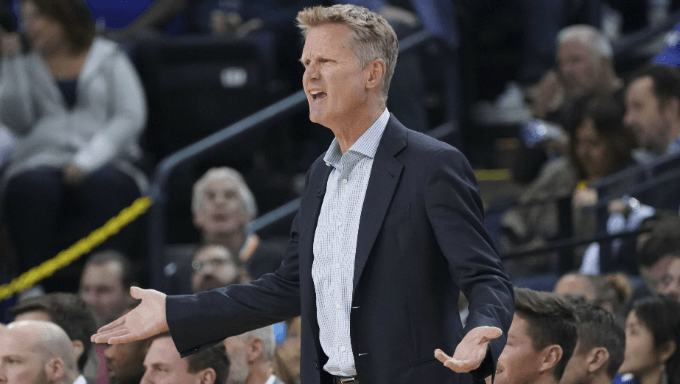 The data is a bit skewed by Steve Kerr’s Warriors winning 73 games in 2016, but even still, the Coach of the Year has gone over 58 games nine times. Just once has the Coach of the Year gone under 50 wins, and that happened in 2007 for Sam Mitchell and the Raptors. So don’t just find wins; find a lot of them. Within winning comes your standing in your respective conference. In that 2001 to 2018 span we’re looking at, 10 of the 18 teams finished first in the West or East. Two others finished second, and two others finished third. That’s 15 of 18 teams that finished in the top-3; the outliers were a fourth-, sixth- and eighth-place finish. So while it’s not a sure bet – what is in today’s betting world? – it helps to find a team that’s going to finish at or near the top of their conference. Wins are important, but so is improvement. Coaches who have guided great teams in the past rarely get credit for doing it a second, third or fourth season in a row unless, like Kerr, they make history. This award is based largely on a team taking strides from good to great, or great to historic. And that means an uptick in wins. Specifically, from 2001 to 2018 the Coach of the Year’s team improved by an average of 14.6 wins from the previous season. In an 82-game season that’s massive. In 10 instances they increased by 17 or more wins, and in every year the team won more games than they had the previous season. Look for teams that are making a significant jump from where they were a year ago. Great coaches make their players better, but there’s usually talent there from the start. We’re not saying you need to find the likely MVP, but of the 18 men to win Coach of the Year, 15 had at least one player named to an All-NBA team. First-teamers were the most common among those years, with 10 teams having at least one of the five best players in the league. And only the 2004 Grizzlies and 2013 Nuggets didn’t have at least one All-Star on their respective teams that produced the Coach of the Year; so don’t spend too much time digging for diamonds in the rough. Coaches of the Year are helped out plenty by star players. This shouldn’t be a surprise given how the game is trending, but offenses tend to win most awards these days. From 2012 to 2018, all seven Coach of the Year winners had top-6 offenses. Three of those teams had defenses that ranked outside the top-10. These winners put it all together on both ends of the floor, but if you’re looking for a tiebreaker it’s about how well the offense is playing (having a top scorer doesn’t hurt either. That, in today’s game, leads to more victories. From 2001 to 2011, only four of the 11 Coaches of the Year had top-6 offense, whereas five had top-6 defenses. The game has shifted incredibly, and the best coaches in the game are moving with it.